Getting started in SuperMiata - TrackHQ.com, the Web's leading forum for track day enthusiasts, racers and time attack drivers. Much of what is listed below is only suggested to make your Miata last even longer and be cheaper to run. Better cooling, better brakes, more durable engine, etc. Which year Miata for SPM? We equalize the different years by running the same basic engine, weight and aerodynamics. For example, the current points leader is a '91 1.6 chassis with an '03 NB2 engine. The front air dam and rear duck tail cancel out any aero drag/downforce differences between the NA and NB. So if you build a SuperMiata, it doesn't matter which year you start with. Power is capped at 140whp, torque at 132 lbs max on a Dynojet, SAE corrected. We allow an aftermarket header, cold air intake and programmable ECU and also E85 fuel if so desired. Commonly referred to as I/H/E + ECU (Intake/Header/Exhaust). These bits usually add 10-20whp to a Spec Miata engine. A reasonably healthy junkyard NB engine will make 140whp on pump gas with these parts. Thus, no need to build a specific race motor. The 1.6L from the 89-93 just won't make enough power to be competitive. You can legally run one but at 2300lbs, you'll never be able to run at the front no matter how well you drive. If you have a recently rebuilt NA8 engine with no more than 3% leakdown and above 190psi in all cylinders, you can run E85 fuel and meet the power cap of 140whp, but just barely. We recommend getting a freshly OEM rebuilt NB1 or NB2 engine. Run on E85, you have the option of tuning a second ECU map for as, much as 160whp running our Miata Challenge TT series which has no power caps. Having extra power available is handy after say 8 months of racing when you car might be down 3-4whp. Simply go back to the dyno and retune a bit to bring it back to the 140whp cap. If you currently have a "pro motor", no problem. If building a motor from scratch, you can add some forged bits as insurance against over revs. This is usually forged rods (same weight as stock), ACL race bearings, Supertech light double valve springs. These bits will let you flub a shift buzzing it to 8200 without creating an unwanted inspection port in the side of your block. This is a good place to start for chassis setup and alignment Miata Race alignment. The SM 700/325# kit was designed to a budget using OEM replacement shocks designed for 150# springs. Your Spec Miata Bilstein will work for starters but you can greatly improve the predictability and overall grip by replacing it with better matched components. Any good single adjustable coilover than can handle 800/500 rates is a good place to start. SM sway bar kit is close but further improvement in balance can be found by increasing front and decreasing rear bar diameters. We also allow urethane suspension bushings which improve handling precision and response, and last forever. We only allow the OEM 5 speed from 89-05 Miata. You can run any OEM Miata rear end ratio (3.9,4.1 or 4.3) but the 4.3 works best. Only diff allowed is OEM Torsen or open. Torsen is key to good handling so you want one. This is the same basic setup as SM so no changes needed there. Clutch must be either 1.6 or 1.8 OEM size. Light flywheels allowed provided they are OEM diameter. This means you can run a lighter, less expensive 1.6 clutch/flywheel assembly on your 1.8 engine. You can run near the front without the aero but on the faster tracks, the simple add-ons will improve the grip and balance enough to make a difference. Plus it looks cool. This is usually a .90 ~.125 HDPE (High Density Polyethylene) sheet wrapped around the nose. Most drivers install "rivnut" or nutserts into the OEM bumper skin and simply drill holes in the skin. The hole for the radiator opening should be no less than 1/3rd of the total area of your radiator core. Don't use to fine a mesh over the opening or you'll block airflow. There is no limit to how low you can run the air dam. In practice, about 3" off the ground when parked is about as low as you can go before it self clearances under braking dive. This is usually a 1/4 to 1/2" plywood plate wedged into the subframe between the steering rack mounts and suspended below the bumper with two small steel cables. Depending on your bumper skin, you may need a simple spacer block to hold the under tray at a good height. The undertrays seem to work best when they meet the air dam about 2-3" up from the lower edge of the dam. The OEM under tray works fine but we find better cooling and less aero lift with a big flat plate covering everything forward of the front axle centerline. You may wonder why all the rear spoilers in SPM are clear. The better to keep an eye on all those losers behind you! We generally use .125 or .187 polycarbonate. Lexan and Makrolon are two common brands. It is important to be able to change the angle so adjustable length support rods are recommended. Either mcmaster-carr generic threaded rod or the nice Longacre alloy ones. SPM allows several useful mods that will increase the reliability and longevity of the power making bits. We encourage the installation of a coolant reroute which corrects the coolant path through the engine to prevent cooking the rear cylinder like the stock system does. We also allow any oil cooler to prevent the 300°+ oil temps that are typical in SM. If you want to further improve engine cooling, you can ditch the OEM deflector and undertray and replace them with your own ducting. This works to seal up all the air gaps that exist in the OEM stuff. Venting the hood is also legal and really helps bring temps down. Brake proportioning valve is legal and that fine tuning threshold brake bias helps prevent flat spots. Our Spec tire for 2015 is the 225/45/15 Maxxis RC-1. This inexpensive and long lasting tire when mounted on a 15x9 has about the same overall grip as a 205/50 Toyo RR mounted on a 15x7, but lasts about twice as long. One key to why we chose the RC-1, they are fast even with many heat cycles on them. No need for fresh stickers every weekend to run at the front. The 225/45 will fit onto a 7" wheel but it's pinched and will not work as well. Better on an 8" but proven fastest on a 9" wheel with about a +35 to +36 offset. We recommend rolling the front fenders (google it), rears are fine as is. Any current comp license from POC, PCA, BMWCCA, AROSC, SCCA, NASA is eligible for SPM. If you do not already have a comp license contact Aaron at Speed Ventures about getting an SV Comp license. Speed Ventures is the exclusive host to all SuperMiata races. We run a 10 weekend schedule over 8 tracks. Our Miata Challenge TT series runs the same weekend so you have access to that competition in your car as well. This season SuperMiata will have 28 individual races. We usually have 2x 20 minute practice sessions, one 20 minute qual on Saturday. Race is two back to back standing start Super Sprints lasting about 5-6 laps each. The second race is an inverted grid with the drivers shuffling positions on the cooldown lap. Sunday is inverted grid again, two standing start SuperSprints. Does that sound like the fastest guys have to start at the back 3x during the weekend? Yup. The idea is to get even the new drivers into the mix, learning how to watch their mirrors, defend and follow the faster drivers as they come through mid race. Needless to say, we get some exciting first laps. We pride ourselves on excellent situational awareness and relative scarcity of contact. This is no mean feat when you take into consideration that every driver either passes or gets passed about 20x during a weekend. There is a lot of passing. If you think standing starts sound exciting, you are right! 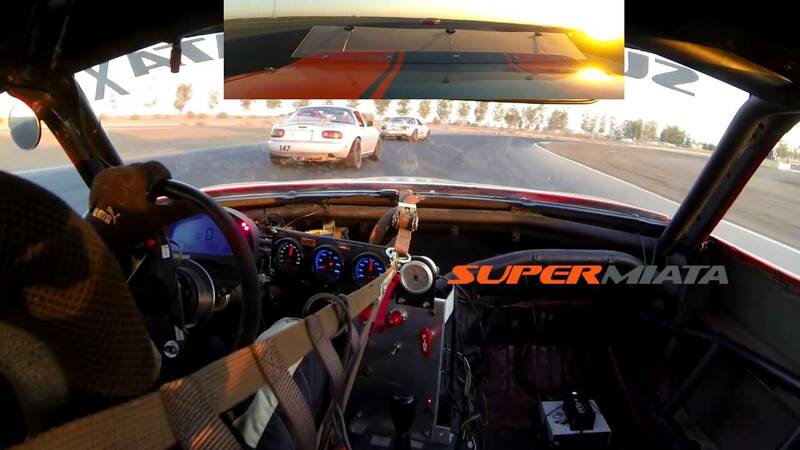 We built a special HPDE car with full SPM running gear just for coaching. We call it the taxi and painted it yellow. It allows the driver & passenger to communicate via bluetooth headsets built into our loaner helmets. It has proven a key ingredient in getting either experienced drivers new to a track or less experienced drivers new to racing, up to speed quickly. Most of the shops with rentals or cars for sale also offer expert coaching with some of the NASA national championship wining drivers now in SPM. Beyond that, an integral part of SPM is mentoring and coaching for those new to wheel to wheel. You will never get a cold shoulder or closed door if you ask one of the front runners for tips on setup or driving. Standard for most race weekends is everyone bringing their data/video to William's RV (Race Central) to share and review. Even some very quick drivers from other series have benefited from some SPM-specific knowledge in these downloads. Saturday night we almost always have a BBQ with free beer, all sponsored by 949 Racing for all the SuperMiata drivers and crew. We encourage camping at the track. Much better bench racing around the fire and no drive back to the motel. FWIW, we simply don't allow cheap beer. It's craft beer or nothing.. What was I talking about? Oh yes, racing! Last edited by emilio700; 09-01-2016, 06:28 AM. Any SPM cars to rent to try out a race weekend? Last edited by granth; 10-30-2014, 09:29 AM. God, I need Tom to move so we can start this up out here. I knew I would forgot something important in the post..
Edited to add rental info. Most of the guys with rentals also have complete race ready cars for sale. Good thread. I didnt know you guys ran (2) 5-6 lap races back to back. At some point will you guys incorporate a 30min sprint race? we've ran a few events (want to say 3 weekends out of 10 ?). it is when we ran with another group. they are not comfortable with our 2 15 min race, reverse grid (between 2 back to back races) and standing starts. but most of us really liked the 2 15 minutes race (in reality, it is more like 2 13 minutes race, because of out lap and in lap). a lots of action every lap !! it took a few races to get all the kinks out of this format. We are all pretty comfortable with it by now. but I understand this is too complicated for a bigger organization or a multi-class races. Last edited by bellwilliam; 10-31-2014, 01:22 PM. The drivers unanimously prefer the two back to back standing start supersprints. You have to try the format. It's an intense 30 minutes whether you are at the front middle or back. I did not know you could make a miata fast in a straight line and slow in the turns?? Oh and anyone who has not raced "reverse grids" are missing out on some really fun racing! Last race of the year is this weekend? Got a schedule for 2015 yet? We will post it when we have it. I keep bugging Aaron. More importantly, why would you be interested in next year's race schedule?